Current nursery management research is building on work started several decades ago into the benefits of ectomycorrhizae (ECM). ECM are fungi which form associations with tree roots and promote plant growth and health. Research into current conventional nursery practices involving the routine application of fertilisers and fungicides has shown that these chemicals change ECM composition and plant growth. Trials have progressed from experimental to operational scale at commercial forest nurseries and now have moved to forest plantings. A body of convincing evidence is building: lower inputs of fertilisers and fungicides in the nursery result in healthier seedlings with above average survival and growth rates once the trees are planted out in the forest. The next phase of research involves the use of biuret, a novel growth stimulant, which can be applied at much lower rates than conventional urea fertiliser, and may stimulate the uptake of nutrients by seedlings in the forest (see Section 4). The outcomes of this research for both the nursery industry and forest growers include growth gains, cost savings, and environmental benefits, enhancing the industry’s licence to operate. automated physical processes in nursery settings – chemical handling, inventory, lifting and grading. improving links between nurseries and forest growers. Murray’s Nurseries, based in Woodville, produces five million radiata pine seedlings per year. Manager Patrick Murray is experimenting with a range of low input practices, and is convinced of the benefits in terms of both the quality of the trees produced, and to the business as a whole. By 2016, the nursery was using zero fungicides; in the 2017 season, which was very wet, some spraying for botrytis was undertaken. However, the nursery now only applies fungicides reactively, unlike many nurseries which continue to operate preventative spray regimes. experimenting with radiata pine cuttings as well as seedlings. Murray’s Nurseries collaborates with a number of research and development organisations, and is closely involved with many facets of the forest industry. The Bio-Protection Research Centre has a strong international track record of working with agricultural and forest industries to introduce fungal endophytes into plant nurseries. Gains worth millions of dollars have been achieved, for example in Malaysia and other South-East Asian countries. Endophytes are fungi that form natural associations with plant roots, improving growth and disease resistance. In New Zealand, the Centre is working to introduce beneficial Trichoderma fungi into radiata pine nurseries. It is anticipated that Trichoderma will reduce the incidence of foliar pathogens of radiata pine by enhancing plant growth and disease resistance, both in forest nurseries and in plantations. This will eventually lead to significant production and environmental benefits, and cost savings. Early trials from applications of Trichoderma in nurseries show increases in seedling height, stem diameter and root biomass compared to conventional stock. The best endophyte treatments are now being trialled in over 20 plantations throughout New Zealand, in collaboration with forest owners, and from these, further trials will be established using the ‘best of the best’ endophytes. Research is also showing that Trichoderma persists in root tissues, with an isolate applied in 2012 still present in roots four years later. Establish eight large radiata field trials in 2018 to validate the best Trichoderma treatments to date. Assess the feasibility of treating established trees with Trichoderma to mitigate disease problems. Isolate and characterise cold- and warm-tolerant strains for use in colder and warmer regions of New Zealand. Assess the potential of Trichoderma treatments to control cypress canker. Assess the potential to improve growth and control Swiss needle cast in Douglas-fir. Future benefits for the forest industry, based on reduced chemical inputs in nurseries, healthier trees which grow faster, and protection against current and future pathogens, are valued at many millions of dollars. If a new, as yet unknown, radiata pine disease is combatted in the future, the benefits could be priceless. The aim of biostimulants is to speed up or otherwise enhance some of the natural processes which occur in soil, within trees, and in the wider environment, and which determine tree growth and productivity. Biostimulation involves developing systems that produce positive growth responses. For example, the rates at which soil microbes and soil animals release mineral nutrients from organic matter is a key limitation in natural nutrient cycles. Researchers have been investigating the potential to use a nitrogen-based compound, biuret, to stimulate forest soil microbial activity, hence speeding up the break-down of organic matter in soils and the subsequent uptake of nutrients by plant roots – in other words, speed up the nutrient cycle. Biuret is a bi-product of urea production. It is known to be toxic at low rates to many plant species, but radiata pine appears highly tolerant of biuret. Seedlings treated with even relatively high concentrations of biuret have survived and grown well above the rates expected of seedlings grown under normal nursery fertiliser regimes. Trials at operational scale in a commercial nursery have been established, and are now also underway in plantation forests, with significant interest and support from private forest owners. Scion is establishing a new series of ‘Accelerator Trials’ and biuret will be applied to seedlings already planted in some of these trials. The rate of application – around 125kg/hectare, is far less than perhaps the 500 kg of nitrogen/hectare that might conventionally be applied, emphasising the potential for both environmental gains and cost savings for the industry. Challenges remaining include how to apply what is a very insoluble chemical, and obtaining biuret in commercial-scale quantities. The potential for applying liquid fertilisers and biostimulants directly to tree foliage is also being investigated as an alternative to conventional granular fertiliser applications. In theory, application to the forest canopy gets the nutrients directly to where they need to be, rather than having to wait for the processes that go with uptake of nutrients by tree roots. can potentially be applied with other operations. 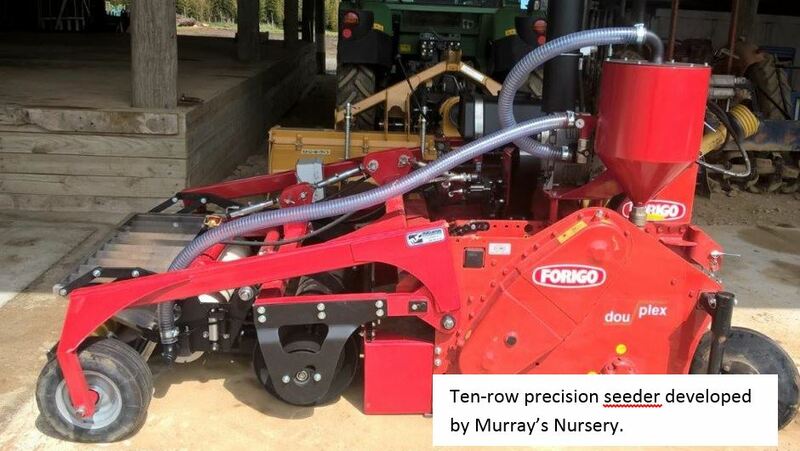 Small-scale trials of foliar applications of a range of fertilisers have provided encouragement to researchers, both in terms of actual growth responses and of the cost-effectiveness of foliar applications. A ten-fold or a $100/ha cost advantage was obtained from foliar N application in trials carried out on small radiata pine in both 2015 and 2016. Trials are planned at national operational scale next, and researchers will continue to refine practices so as to maximise gains for forest growers.